I have been using the Affinity Photo Beta extensively over the past couple of months. This is screen shot attached is coming on when I try to load a file that has been saved in tiff as a PGD? 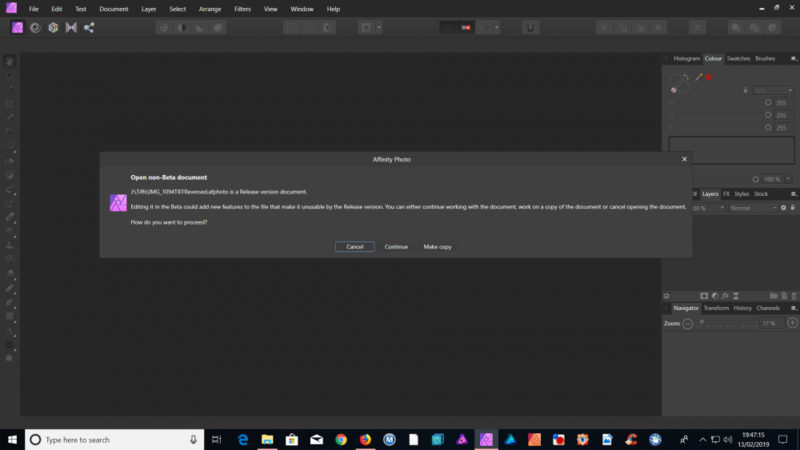 If I shut down the beta and load Affinity photo (not beta) the same file will not load until I have repeatedly pressed the left mouse button. then a message strip comes on the screen above Affinity and says Affinity is not responding. The blue timing ring is activated all the time. Then the photograph finally comes on. I can load a 'normal' i, e. tiff shot without problems other than waiting for it. Sceen shot from beta below. "As this is a beta it is considered to be not suitable for production use. This means that you should not attempt to use it for commercial purposes or for any other activity that may be adversely affected by the application failing, including the total loss of any documents. " No files are backward compatible and it is great to see the warning appear. I guess you could create a bug report for retail version that it does not gracefully handle newer files.